I work as an attorney for children in Brooklyn Family Court. Essentially, I represent kids ranging in age from between newborn to eighteen in cases where New York City Administration for Children’s Services has alleged that parents have abused or neglected their children. In New York, once a child can articulate a position (usually around seven years old), attorneys for children directly represent the child’s position—so if my client wants to return home to their abusive father or their untreated bi-polar mother, my job is to zealously advocate for that outcome. Now, my job also includes counseling my clients to help them arrive at a fully considered position and to be aware of all their options, and just because the child wants to return home to an abusive or unsettled environment doesn’t mean that the judge is going to order it. Nevertheless, once my client has arrived at a position, be it returning home, entering foster care, or accepting services, that position becomes my position. Normally I represent all the children in the family, which can be up to seven or eight kids, and overall, I currently represent around 170 kids. The cases filed by ACS almost exclusively involve families from poorer neighborhoods in the borough, and the families are about 95% black or Hispanic. The family problems and issues that I deal with range from profoundly dysfunctional and damaging to mildly off-kilter. To get a sense of my day-to-day, one need only keep in mind that I work in a court—a place defined by disagreement and conflict; and I work with families-and we all know how crazy family can be. The problems of my work environment are further exacerbated by extreme poverty and race issues, and overarching all of this madness is a contradictory and confused bureaucracy that represents a citizenry that would prefer that these problems just didn’t exist. All this is not to say that there isn’t some genuine brightness within all the gloom, and for some reason that I continue to grapple with, I do like my job. But it can be, to say the least, trying. It is also a fertile for place working with the precepts. I’ve always been struck by the image of Kannon Bodhisattva — the one who hears the cries of the world and selflessly responds to those in need. In deciding to become a public interest lawyer, I wanted to emulate and become that selfless responder. Looking back, I realize what a profoundly naïve and romantic view I had of suffering. The image of suffering that I unconsciously held was probably more gently mewling babes and distressed virgin princesses. My response to that need was to be total and complete and deeply satisfying. Having worked in Family Court for six years now, I can say that my experience of the cries of those in need is that it is far more insistent and shattering, and all too often arises from a seemingly bottomless and inexhaustible well. Needless to say, I can feel powerless to truly respond to this—particularly, when so much of the suffering is self-inflicted and consistently reenacted. When the cry is: I wish my mom would stop using drugs; or I wish I didn’t live in a neighborhood of decrepit houses, overcrowded schools, and extreme menacing violence; or I wish I knew who my dad was—what do you say to that? When the neglected and abused child so often becomes a neglectful and abusive parent—how do you intervene? As I said earlier, I continue to grapple with why I like my job. Why am I called to this work? Why, when I share so little in common with my clients and their basic life circumstances, why do I feel a need to place myself in that realm? Why, when I have had such a privileged upbringing and continue to live in such a rarefied world, why spend my days amongst such suffering? The precept that arises for me most often at work is Realize self and other as one. Do not elevate the self and blame others. Why do I do this work? It touches me deeply—I can’t turn away. I grapple because I want to. And, somewhere amongst the confused morass of my psychic motivations, I know that the issues that my clients deal with are my issues. There is no gap in our suffering. And I know that I can completely respond to it. Placing myself in Brooklyn Family Court somehow heals us—I don’t know how. I have yet to fully realize the completeness of these intermingled realities, but amidst all the craziness and pain, I don’t want to be anywhere else. My principal cautioned me that Daymond wouldn’t go far; he was headed straight to jail where he belonged. This was not an unusual encounter. Many of the folks I worked with were quick to arrive to kneejerk opinions about students, dividing them into “good” and “bad” kids. Much of my work in education has been with students who, for one reason or another, are labeled “at risk.” These are the “throwaway” kids, the students who, all too often, get the message that they are not worth much. They frequently show up in my classroom in distress: enraged, depressed, lost. Daymond was no exception. He quickly made known the pleasure he took in hurting others, the pride he derived from his frequent vicious street fights. He bragged incessantly and was adept at a subtle form of bullying. His anger was ravenous—intensely alert to any possible opening, any chance to pounce. I struggled to maintain harmony, to keep Daymond’s anguish from engulfing the classroom, to keep class from becoming all about him. The assistant principal was no help. She instructed me to write Daymond up as often as possible so that it would be easier to kick him out when the time came. Wholehearted learning requires spaces that are safe and inviting. For students to engage the process, and most importantly, for them to begin to direct their own education, I must have their permission to teach. Without their permission they will still come to class (sometimes), they will sit in their chairs and go through the motions−but they won’t allow me in. They won’t reveal their embarrassment at having never understood fractions; they won’t be present enough to engage in a class discussion; they won’t connect to a text. Daymond’s permission to let me teach him was not easily granted. It was a constant, violent tension, in which he was acutely attuned to any lack of presence or any minor judgments. After one particularly grueling day I vented to a few colleagues. They were eager to demonize Daymond. They pointed out that it would be relatively easy to get him on a long-term suspension, and that what happened to him after his removal wouldn’t be my concern. Someone added that, with any luck, the cops would arrest him soon and he’d be in jail: problem solved. Instead of finding the encouragement I had hoped might help me to reenergize, I found myself shutting down and feeling like I needed to protect Daymond from the larger school community. Over time I learned that Daymond was born into a family of Bloods, that he first sold crack at age seven, that he saw people stabbed and shot before he ever made it out of elementary school. Knowing him hurt my heart and wore me down. I lost hope of there ever being any shift within him. Still, I continued to hold space for him, to accept him, even as the delicate dance of keeping him in line while earning his trust exhausted me. Eventually, Daymond began to settle. One day he drew me a cartoon that I hung by my desk. The next day there was another cartoon. That provided me with an opening to animate his cartoons for the class, and before Daymond realized it, we were all being soft and silly together. From there things moved more quickly. He stayed after school to catch up on his work. The other students began to open to him. When he finally got fractions there was a feeling of euphoria in the room. At graduation Daymond arrived in a three-piece suit, his mother beaming behind him. My experience of Daymond’s volatility and apathy, while it was frequently painful, was never dis-empowering. It was an honor to intimately bear witness, to offer him space for new possibilities. Conversely, I experienced many of my colleagues’ responses to Daymond as disempowering. Whenever I mentioned any “bad” student I was answered with the mantra that, “It’s all up to the students.” Feeling mildly chastised, I would respond with a nod, while anger flushed through my body. Yes, I thought, of course it’s all up to the students—but isn’t it all up to us, too? I experienced a sense of helplessness in these interactions, a feeling that I was in hostile waters, a fear that I was alone in my concern for the students. I found myself both judging and feeling judged. I numbed out. Separation occurred. Truly, some of my colleagues were not suited to be in positions of power. Moreover, the way our school functioned was often dangerously disconnected from the students it purported to be serving. Nonetheless, it is clear to me that I related to my colleagues’ fear and apathy much the way they related to Daymond’s. I was not willing to accept their disregard of certain students as if, by not accepting this, I was changing it. After countless seemingly failed attempts to shift our school’s culture, I retreated from those colleagues whose perspectives pained me. In so doing, I infused the distance between our pedagogies with an obstructive sense of permanence. In retrospect, I see that my efforts to enliven our school’s culture were dependent upon results in a way that my most successful work with students isn’t. I wonder, what could have been possible had I not solidified my perceptions and allowed the intimacy of my soft, unprotected heart to function freely? I am Buddhist. 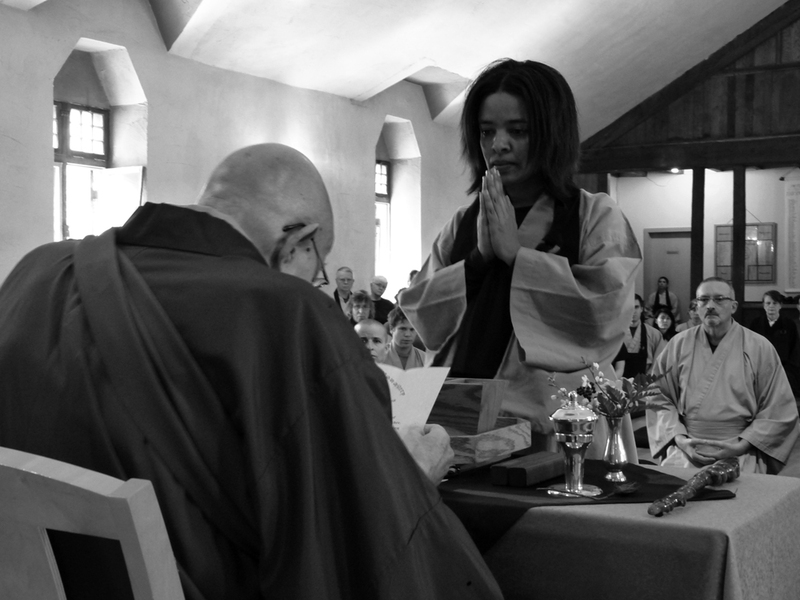 As a lay practitioner, I vow to follow a specific set of moral principles—contained in the Bodhisattva Vows, the Sixteen Precepts, daojin ordination vows, and the broader moral and ethical principles contained in the teachings. Work has always been a big part of my life and, with so much time invested in professional activity, it has been important for me to understand the workplace as a practice field—a setting for spiritual, as well as professional, development. As an ethics officer, I was responsible for ensuring that key ethical principles of the organization I worked for were in place and being followed—these values define what’s acceptable within the company and must be consistent with regulation globally. I was very fortunate to be in healthcare, at a company with a clear mission to save lives and improve the quality of life. This, of course, is the first bodhisattva vow. Still, when I started practicing, I felt conflict between corporate life and goals and the personal resonance of the Buddhist path; they seemed incompatible. I did not talk about my spiritual practice with colleagues at work, and if someone asked what I did over the weekend, I said I “just sat around.” Close friends and colleagues began to comment on a change in my behavior, yet I felt a conflict between work and spiritual paths, and I struggled to find their mutuality. Early in my practice, my greatest challenges at work occurred when I sensed a significant gap between my perspective on an issue and that of others. This would result in any number of inaccurate conclusions on my part, such as believing that my views represented a “truer” reality on an issue, or not understanding the difference between what I perceived and other valid perceptions. Furthermore, I would see a difference of opinion as an ethical issue, and I would frame this perceived difference as an inevitable result of the incompatibility of spiritual and commercial values. 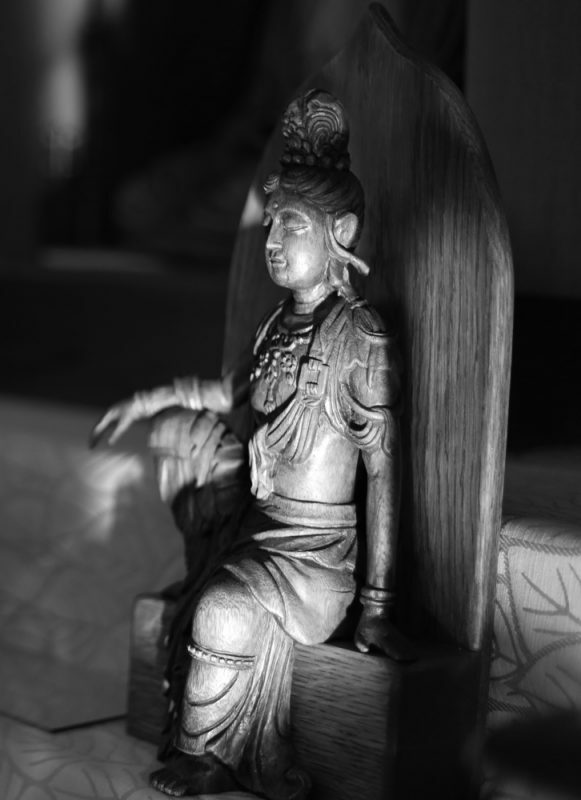 Perhaps ironically, the initial result of my Buddhist study was discord, the opposite of what I sought. Over time, practice became central to helping me understand and resolve this conflict—it helped me develop an awareness of my own reactions to differences and allowed me to see the internal logic and processes I was using-processes that occurred in a fraction of a second. By clearly seeing an ineffective process or a chain of misconceptions unfold in my mind, I was better able stop the process and not incorrectly conclude there was an ethical conflict at play. For me, the ability to see, control, and stop my own mental leaps was hugely valuable for both my work and spiritual practice—common ground! With continued practice in an area that was initially very uncomfortable, I began to see how my emotions of dissonance, disillusionment, or frustration were manifestations of the poison of anger. This is not to say that they disappeared, but that I recognized them and their basic ineffectiveness. In addition to studying my own mind, reactions, and ways of relating to the world, my work responsibilities also gave me opportunities to practice Right Action and Dana Paramita—whether by sponsoring diversity groups, supporting environmental sustainability and community safety, or by participating in community-based outreach activities. Aside from my own direct involvement, I actively and visibly supported what I felt were other right-action initiatives within the company. Thus, over a long time, I found there was a lot of opportunity in the business setting to make a difference, and to contribute in ways very much aligned with my vows. I was able to use all of the work experience—resonant and dissonant—in a positive way. Although it took a lot of effort to see it, work ultimately became a practice field no different from any other part of my life, a place where I was able to respond to the call of the precepts. As a resident of New York City, a Buddhist practitioner, attorney, and the parent of a fourteen year-old son, I am concerned about New York City’s stop-and-frisk policy, a program that gives the police the right to stop, question, and search people who they consider suspicious. I am a multi-ethnic, bi-racial person of color; throughout my life, people have wondered and overtly asked me about my race. I’ve been mistaken for Latina, Caribbean American, South Asian, Middle Eastern and Sephardic—there is definitely something about my appearance that makes people ask, “What are you?” And what has me scared is that to a white police officer, my son—whose father is Caucasian—might look “suspicious.” More than this, I am afraid for all our sons—how can we teach them about what is right, what equality means, and how to treat others while living under the weight of stop-and-frisk? Stop-and-frisk targets people of color. Last year the NYPD stopped close to 700,000 people (up from about 90,000 a decade ago) and last year, 87% of the people stopped were black or Latino. Nine out of ten were totally innocent-meaning once stopped, they were neither arrested nor ticketed. As a Buddhist practitioner who has taken the precepts, it’s difficult for me to remain generous, to see the perfection in others and to recognize my identity with them in the face of a policy that gives overt expression to racial bias. Zen practice is about truth, and it seems plain wrong to me that the superficial classification of skin tone is seen as legal grounds for suspicion. I myself am literally afraid of the police. I never consider contacting them for assistance because I was conditioned to fear how I might be treated. How should I tell my son to deal with the police when those who are charged with protecting his safety might hurt him for no reason? As a practitioner, I am seriously struggling with whether it would be right for me to pass my fear on to my son. I understand that law enforcement faces a difficult dilemma in fulfilling the charge to protect the public. Indeed, the police give up a lot in order to serve the greater good of society. It is the sacrifices of many of these officers, on the streets and in the military, that provide us with the freedoms some of us enjoy. But let’s face it, in our society some of us are freer than others. And, while the responsibility to protect the public carries sacrifice for the officers, it also carries concurrent responsibilities. In the role of protector, shouldn’t officers be held to a higher standard of accountability? Doesn’t an officer’s duty to the public extend to treating the public with basic dignity—treating people, treating children, as human beings? Stop-and-frisk has sown mistrust between police officers and the communities they are supposed to protect; in some neighborhoods, the police acronym “CPR,” which stands for Courtesy, Professionalism, and Respect, is understood as standing for “Cops Practicing Racism.” This policy is, at a minimum, humiliating to hundreds of thousands of law-abiding blacks and Latinos. Every single man of color I have asked about it admits to a fear of the police. Many of us have read or heard about teenagers of color who have been stopped up to sixty times in their own neighborhoods, and about their mothers who tell them to never leave the house without identification—and to never, ever run from a police officer. The violence perpetrated on communities of color is clearly action based on a negative perception of difference, on fear, and on stereotype. That we sanction this policy is especially problematic in today’s super-connected world, where people from many countries and of many races are in more contact than ever before and when people from all walks of life identify with being multiethnic. More of our young people identify with being citizens of the world—our world is a beautiful and colorful place. We need to acknowledge this and learn to embrace our differences because they are part of who we all are. To me, this makes stop-and-frisk a moral issue, and an issue that should concern us all as practitioners—people committed to moving beyond our superficial differences and into the heart of our true nature. Soldiers have a saying that when the situation becomes overwhelming, you do not rise to the occasion—you fall to your training. That is what I found the precepts to be: the training I fall to when nothing I think I know is of any use to me. In 2005 I went to Afghanistan to make a documentary. It took five trips and three years to shoot, and another two years to raise the money and edit. I arrived in Afghanistan as a devout member of my tribe, the liberal Democrats, and certain in my tribe’s faith in the evil of all things war, and in the absolute wrong of all things right­wing. Once there, I found myself surrounded by another tribe, one that saw me with equal conviction, but from the opposite angle—as a godless, tree-hugging feminist, and a liberal member of the lying media. All eyes turned to me—hostile, judgmental. And in response—my judgment of them. This is where all those years of training came to save me. See the perfection. Do not speak of others’ errors and faults. And there it was—I saw, clear as day, my mind roiling with judgments: closely held truths about men and the far right, movie-fed fantasies about the honor of the American soldier and potent anti-military images leftover from the 70’s. The depth to which these judgments went in me was sobering—it had always been reality—but in that moment I saw that it was nothing but the refusal to listen to another. And my assumption of how they judged me was built on my judgments of them. I was older than most of their mothers. Suddenly I saw boys who felt that being a soldier served something true and good. They did not want my pity, my wisdom. They did not want my compassion or my help. We had all seen the same movies. I had a nano-second between the craving for certainty, and the grasping of a judgment. In that gap, I managed to see what was in front of me. They laughed, snorted, guffawed—suddenly they were a group of individuals with individual reactions. Here I was, swearing to lie for them. To preserve their ego. This is moral? But what I caught a glimpse of was boys terrified of being embarrassed in the test of their lifetime. What they heard me say is, “I understand. We can’t talk about the way it really is here. No one gets it. So you say what they want to hear, what will get you laid, what you can hide behind. It’s okay. I will not bust you.” It was the last thing they expected to hear. Or I expected to say. The filming went on, things blew up, people died. Nothing happened for months. War is boring, and then it is frightening and then it is impossible—and that creates a bond that is complex. There is a kind of terrible love in war that has nothing to do with personality. Kind of like sesshin. They love the mountain, too. Some of those men I know to this day. We could not disagree more politically, but we take care of each other in a very particular way. If we are to create a tolerant dialogue in a nation, we cannot stand around screaming “You aren’t tolerant!” It leaves no space for the mystery of human connection. To me the precepts are what I can bring to a situation when I am seething with righteousness and contempt, sobbing with injury, trembling with fear, accusing with vigor or glowing with righteous pity masquerading as compassion. There are few things tougher for me to let go of than being right. For me, that is practicing the precepts. They are not about being right, or doing right. They help me find a clearing so I can respond cleanly and without investment in the outcome.